Kites are such an integral part of growing up in India, where we come from. 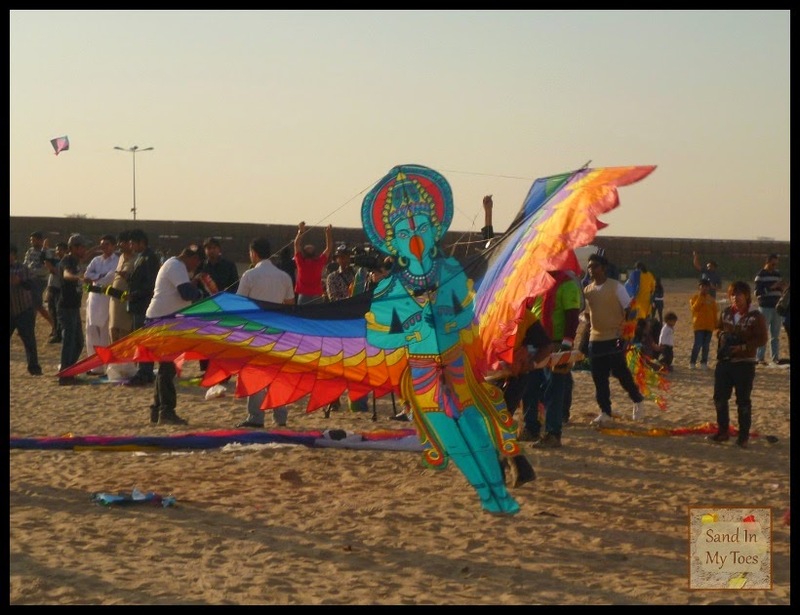 Being an expat child myself, I never experienced this, but often hear my father describe how much of a craze it was for him and his brothers, so much so that they were out flying kites all day! Those were the days, I guess, when electronic distractions didn't confine them indoors. But even today, kids go out to fly kites back there. That's why, I was really excited about the Kite Festival in Dubai back in January. I wanted Little Dude to experience flying a kite for the first time. He had a great time, but the weather here hasn't been favourable enough for us to venture into kite flying again. Maybe in a few months' time! This photo is from the largest kite at the festival. It was huge and colourful, and was quite a struggle for the flyer to get up in the sky, where it only stayed for a few minutes. There's something very symbolic of kites and childhood, isn't it? It must be about the freedom of flying free where the wind takes you, without a care in the world. Wow, now that is one lovely-colourful kite! We used to fly kites too as kids, but ours were never as beautiful as that one ;) #alphabetphoto. what a great kite! It's something on our to do list! Wow, that kite is a work of art, absolutely beautiful! I agree! Your post bring back lots of memories. I remember my grandfather saving kites that would land on our terrace for my sister and me even past January and give it to us when we visited him during summer vacations. I also remember flying kites during Sankaranti alongwith our cousins with great amount of enthusiasm and also made our own kites from newspapers. Those were the days. I am looking forward to another Kites festival here in Dubai where I can take Little A to. I never really got to fly kites as a child, but they are so delightful! The festival was good, except it was really hot that day!